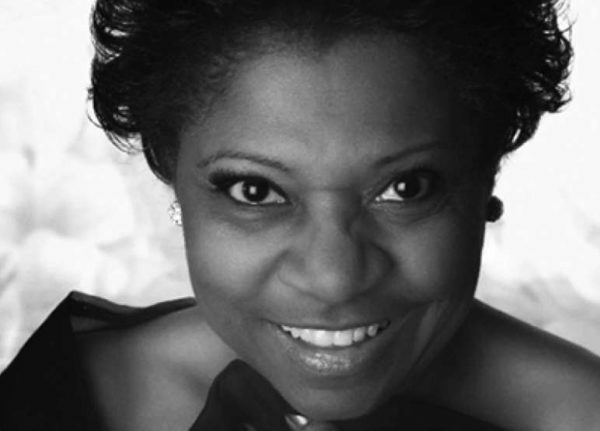 Singer Beverly Cosham is set to take CenterStage exactly one week from today for a free show. Known for her cabaret and theater performances, Cosham will perform songs from the Great American Songbook. The performance starts at 2:15 p.m. next Thursday (March 21) at RCC Hunters Woods (2310 Colts Neck Road). The show is a part of a joint venture between the Osher Lifelong Learning Institute at George Mason University and Reston Community Center. Hunters Woods at Trails Edge, a senior living community under construction near the Hunters Woods Village Center, is on track for its spring opening next year. When complete, the IntegraCare facility will have 210 senior-living units — including 90 independent living units, 81 for assisted living, 24 for memory care and 15 for special needs. 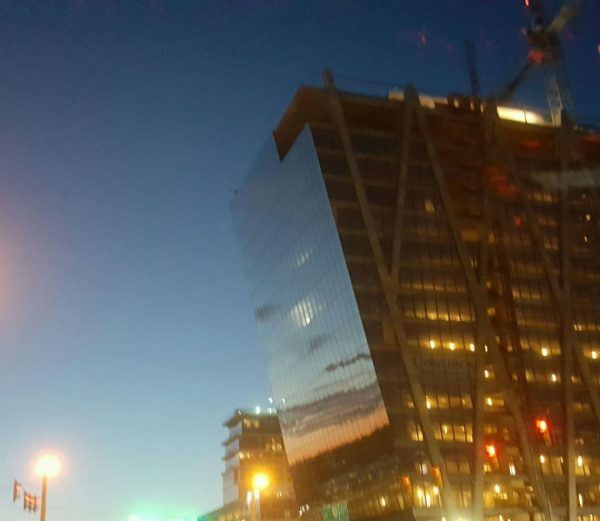 “We believe that it will [open] in May, but have not set a specific date as projects of this nature are always subject to the timeline of county agency approvals,” Cissy Nickel, the community integration director for IntegraCare Corp., told Reston Now. The exterior shell is finished, and the first floor is almost complete, Nickel said. Drywall, trim, flooring and appliance installation still need work. Located on a 4.3-acre lot at 2222 Colts Neck Road, the retirement community took the former site of the United Christian Parish. 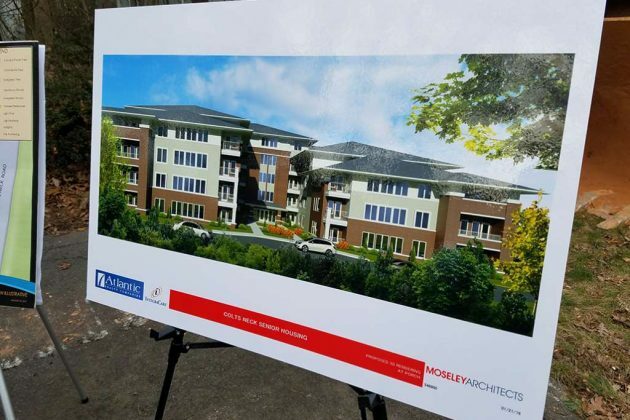 The $72 million project aims to address the shortage of senior housing in the Reston area. Reston Now previously reported that construction started in May 2017. A temporary office and showroom opened in July in the Hunters Woods Shopping Center (2254B Colts Neck Road) to provide more information. An open house is set for Dec. 27 from 10 a.m. to 6 p.m. at the showroom. 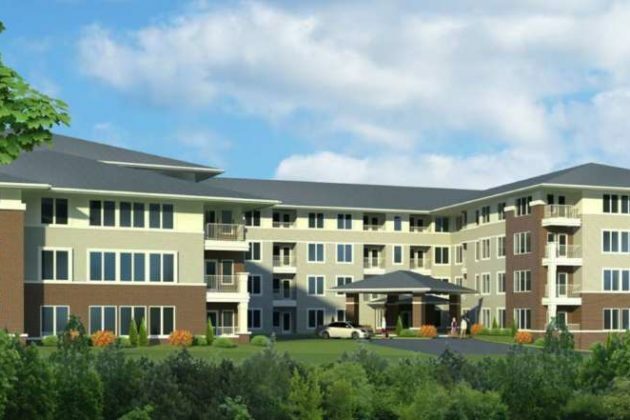 A Pennsylvania-based company plans to complete a senior citizens’ independent living and assisted living facility nears Hunters Woods Village Center by the spring of next year. 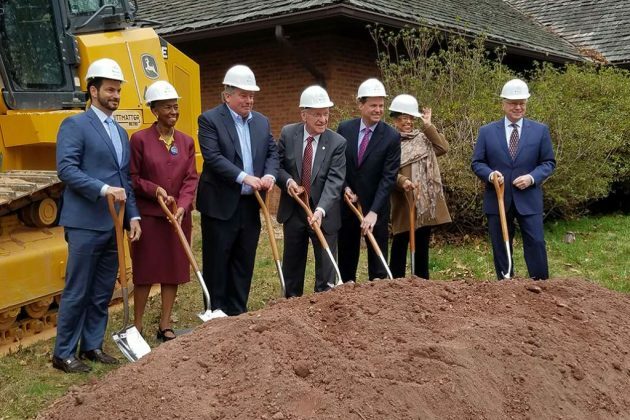 The $72 million project — the first Virginia location for IntegraCare — aims to address the shortage of senior housing in the Reston area. Of the 210 housing units, 91 are for independent living, 80 are for assisted living and the remaining units are a combination of memory care and continuing care. The community, called Hunter’s Woods at Trails Edge, is located on a 4.3-acre lot at 2222 Colts Neck Road, the former location of United Christian Parish. The county approved the project, which is being developed by Atlantic Realty, AEW Capital Management and IntegraCare, in 2007. Nickel said the company sought to mirror programming available for other residents within its community, especially given the close proximity of Turquoise Nature Trail. 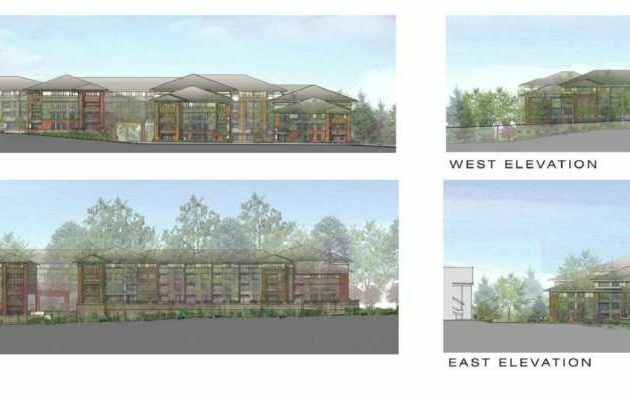 The project includes several dining venues, a beauty shop, a barber shop, an art studio where instructional classes will be offered, a library, a computer laband a garden with vegetables, herbs and flowers. The community will also include what Nickel called “man caves” or separate areas for men and women. An underground garage includes more than 160 parking spaces, in addition to eight surface parking spaces. Nickel said the development team is working with Reston Association and Reston Community Center to provide transportation to and from the organizations in order to allow seniors to attend classes, programs and events. The company is still working on how it will lease market and affordable housing as the project nears completion. Twenty percent of the units are affordable, Nickel said. The income level served by the units was not immediately available. It is likely the company will lease the market and below market units in a rotating cycle. 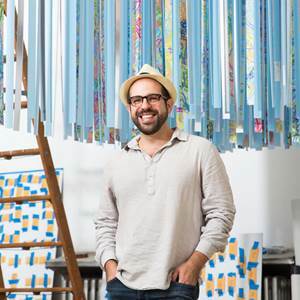 “There’s a huge need in the area and obviously our need is going to exceed our availability. We’re going to have be really methodical about it,” Nickel said. A temporary office and showroom will open in mid-to-late June in Hunters Woods Shopping Center to provide more information, she said. Individuals 62 years and older can qualify for housing. Atlantic Realty Company did not respond to multiple requests for comment over several days from Reston Now. 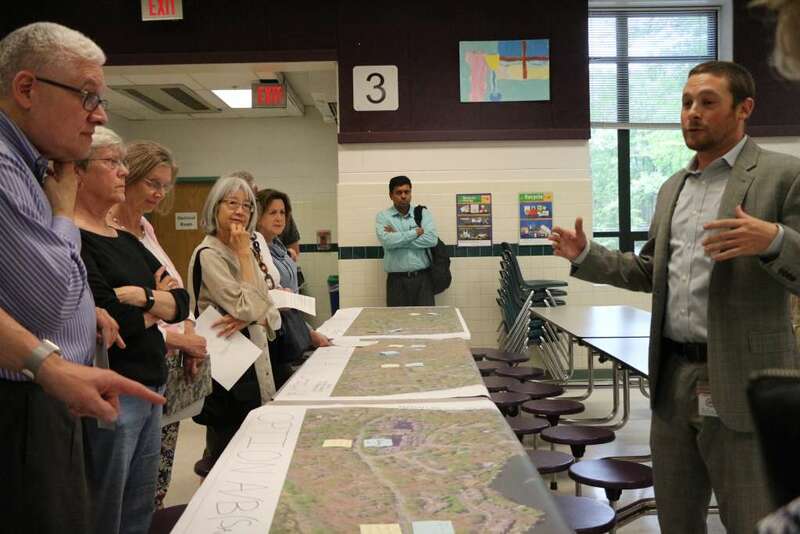 At its meeting last week, the Reston Association Board of Directors discussed requiring compensation for use of an aerial crane for construction on Colts Neck Road that would extend over RA property. 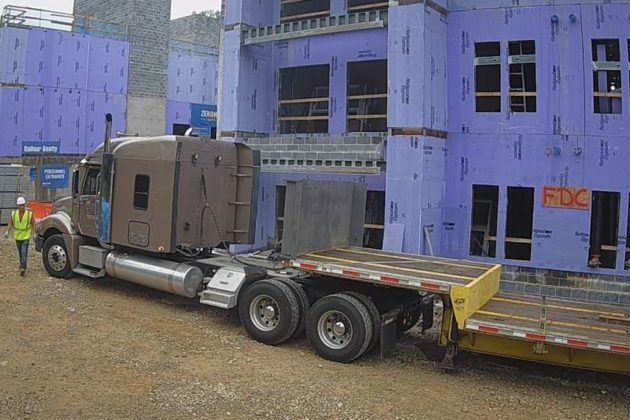 The request by Atlantic Realty Companies is for an aerial crane that it says is needed for the placement of the garage and building structure elements at the Hunters Woods at Trails Edge construction site (2222 Colts Neck Road). The crane’s arm would extend over a portion of RA common area north of the site, the former home of the United Christian Parish church. 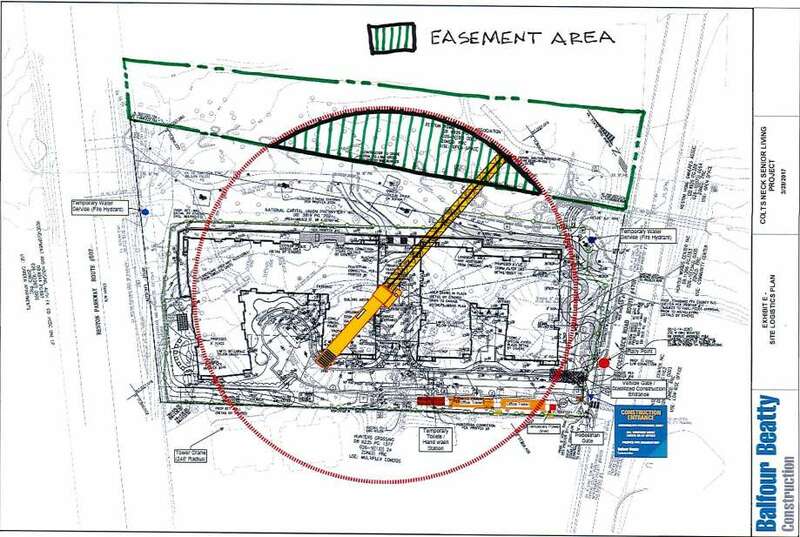 The request to provide the easement in-kind was originally part of the meeting agenda’s consent calendar, but it was removed for further consideration. When the topic came up, Director John Mooney spoke up. 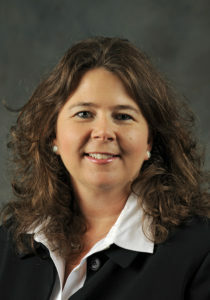 Prior to moving to Reston last year, Mooney was senior assistant county manager in Arlington. No live loads would be carried over the RA property, just the aerial arm of the crane. The arm would be above the tree canopy and would not impact the ground area or trees, ARC says. RA would also be added as an additional insured property on ARC’s insurance policy. CEO Cate Fulkerson and Sherri Hebert, board president, asked what the going rate for such an agreement would be. Mooney said the formula to determine the charge would involve the land value of the parcel in question and the length of time for which it would be used. A representative for ARC said the aerial crane would be in use for about nine months. 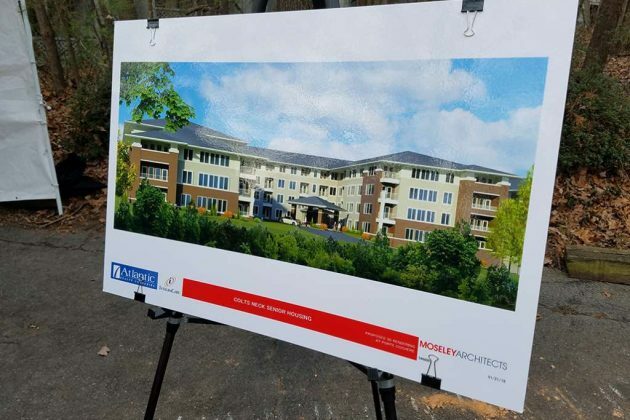 When it is complete, the IntegraCare facility will have 210 senior-living units — including 90 independent living units, 81 for assisted living, 24 for memory care and 15 for special needs. 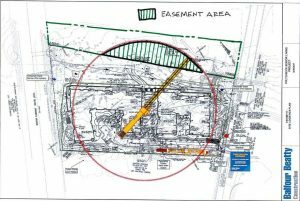 Approval of the easement was tabled and discussion was moved to executive session. 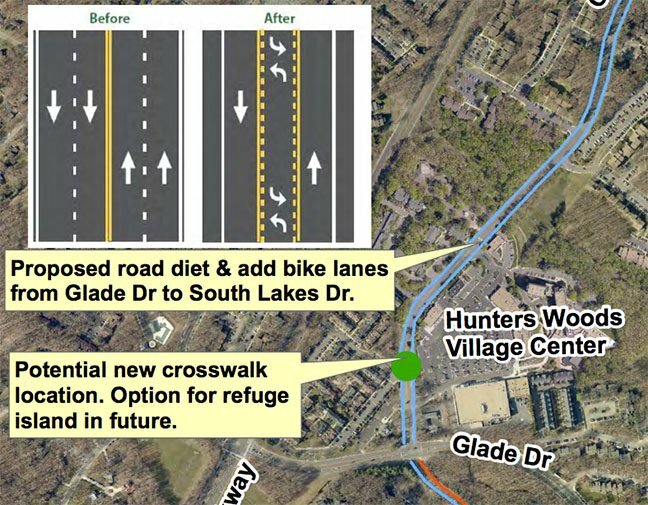 Following a community meeting last month regarding the potential addition of bike lanes to Glade Drive, the Fairfax County Department of Transportation has decided not to go forward with that possibility. A shared-lane marking, or sharrow, is painted in a travel lane to show where bicycles may be on the road and what direction they should be traveling. Lanes remain the same width, as does space for cars to park. 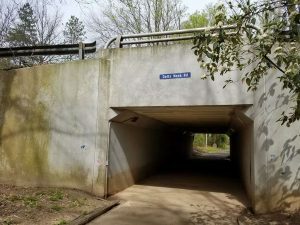 Some residents had expressed concern that if bike lanes were added to Glade Drive, the subsequent removal of street parking would cause problems with overflow parking at Glade Pool, Walker Nature Center, the Quartermaster Soccer Field and other locations along the road. At March’s meeting, a number of residents were particularly concerned about the proposal for the road diet on Colts Neck Road, which will take the road from four lanes of vehicle traffic to two between Glade Drive and South Lakes Drive. Bicycle riders responded by saying Colts Neck Road is particularly dangerous for them and for pedestrians as well. The road diet could also allow for the addition of a crosswalk. Lind also said it is not believed the diet will have a major adverse effect on vehicle traffic. In a presentation during the March meeting, Lind said roads with traffic less than 20,000 cars per day don’t require four travel lanes, and a traffic count showed less than half that on Colts Neck Road. Those cars will be slowed by the diet and safety will be increased, Lind said. 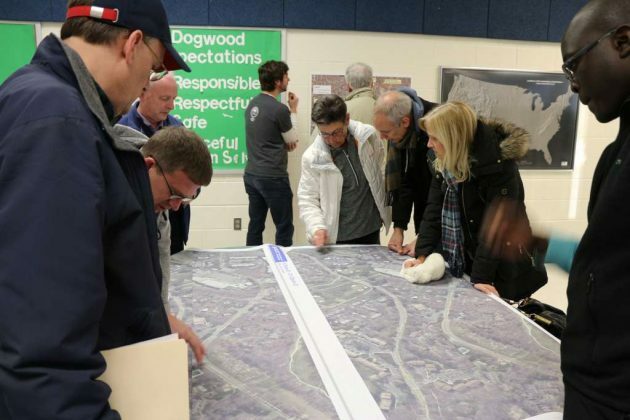 Residents argued, however, that the road is a major “cut-through” during rush-hour times when traffic is backed up on Fairfax County Parkway, and that the road diet would cause additional traffic delays specifically during those times. According to a recent study, less than 1/2 of 1 percent of Fairfax County commuters bike to work — an amount some residents said is not worth potentially causing daily bottlenecking of cars. Possible safety hazards that could be presented by a center left-turn lane were also raised by citizens. Repaving and re-striping will be conducted by the Virginia Department of Transportation after school lets out for the summer, Lind said. Further details will be provided on VDOT’s paving program website. Anyone seeking additional information can request it by emailing [email protected]. File photo at top from Glade Drive community meeting April 27. Map of Colts Neck Road redesign via Fairfax County Department of Transportation. Work surrounding the construction of the Hunters Woods at Trails Edge Senior Living Community will disrupt walkways in the area, including forcing the closing of the underpass to Hunters Woods Village Center, for up to two years. 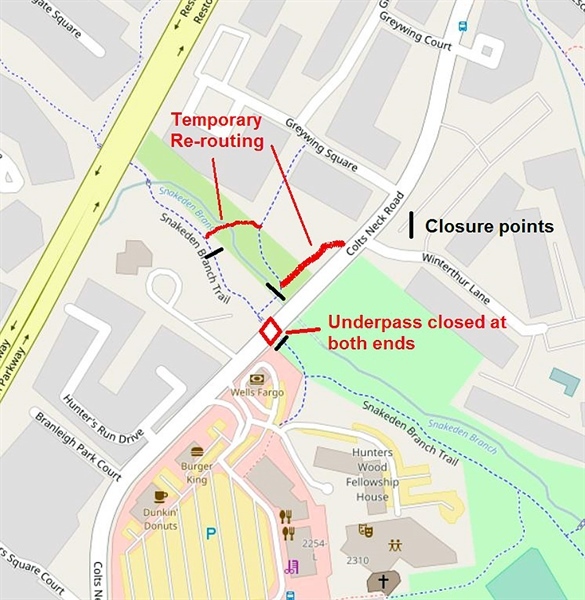 According to information provided by Reston Association, temporary pathways will be created in the area of the construction, 2222 Colts Neck Road. This will include the building of a new pedestrian bridge over Snakeden Creek near the property to ensure access to Colts Neck Road from Reston Parkway remains. 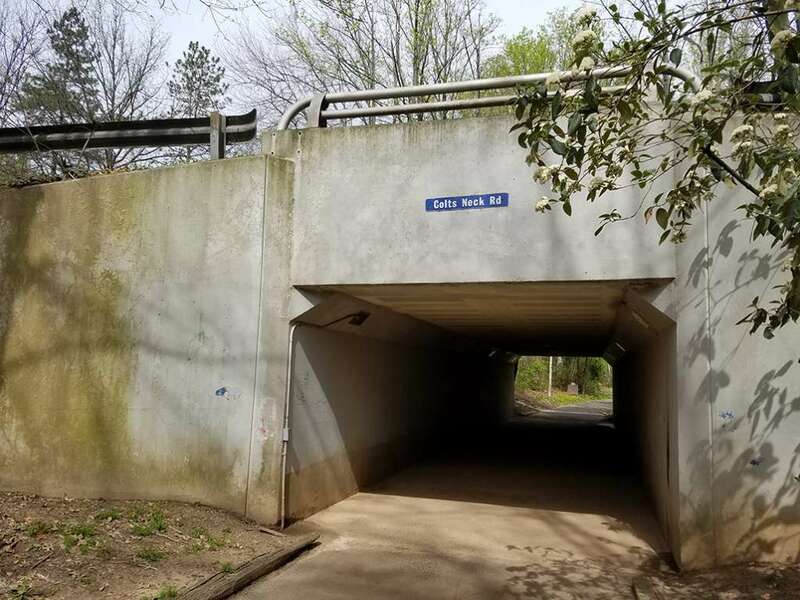 Pedestrians who regularly use the Colts Neck Road underpass to access Hunters Woods Village Center from Reston Parkway can walk to the intersections of Glade Drive or South Lakes Drive where there are signaled crosswalks, RA says. Developer Atlantic Realty Company will pay for pathway alterations in the area of the construction. The temporary trails will be wood-chipped and unlighted. According to RA, they may not be suitable for bicycles or strollers. 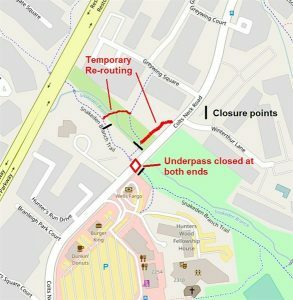 The work to re-route the pathways is expected to begin within the next two weeks. ARC has agreed, as part of its work to construct the senior-living facility to contribute $81,300 to improve pedestrian trails and pathway lighting within a half-mile of the facility. It also will be putting $60,000 into improvement of the facade of the Colts Neck pedestrian underpass, in coordination with Public Art Reston and Reston Association. Dirt was overturned Thursday morning at 2222 Colts Neck Road, which will soon become the home of the Hunters Woods at Trails Edge Senior Living Community. The former site of the United Christian Parish church will be transformed between now and January 2019, project leadership says. When complete, the IntegraCare facility will have 210 senior-living units — including 90 independent living units, 81 for assisted living, 24 for memory care and 15 for special needs. The property is located roughly across Colts Neck Road from the entrance to Hunters Woods Village Center. 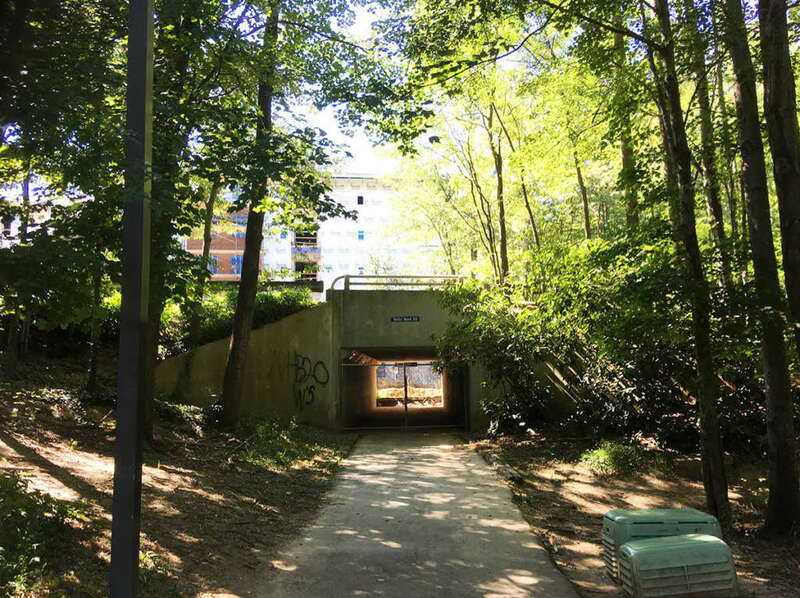 As part of its partnership with the community, the developer has agreed to contribute $81,300 to improve pedestrian trails and pathway lighting within a half-mile of the facility; as well as $60,000 to target improvement of the facade of the Colts Neck pedestrian underpass, in coordination with Public Art Reston and Reston Association. In addition, $20,000 is being provided for capital improvements to the Nature House. Fairfax County Supervisor Cathy Hudgins said these contributions show an understanding of community needs. 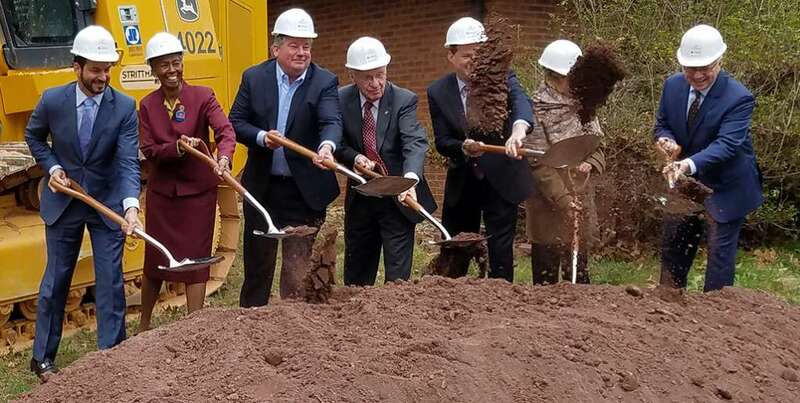 Ellen Graves, president of the Reston Association Board of Directors, said the addition of the senior-living community to Reston is a promotion of founder Bob Simon’s vision of providing for people throughout their entire lives. 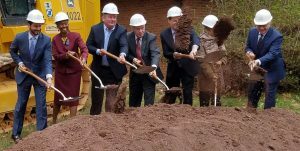 Among the independent-living units, 20 percent will be designated as affordable housing units, while 4 percent of the assisted-living beds will be for those eligible for the Virginia Department for Aging and Rehabilitative Services Auxiliary Grant Program. There is planned to be 48 full-time staff positions on site, with other medical service professionals providing on-site services as well. Thursday’s ceremony represented the latest milestone in a 10-year journey to make the facility a reality. 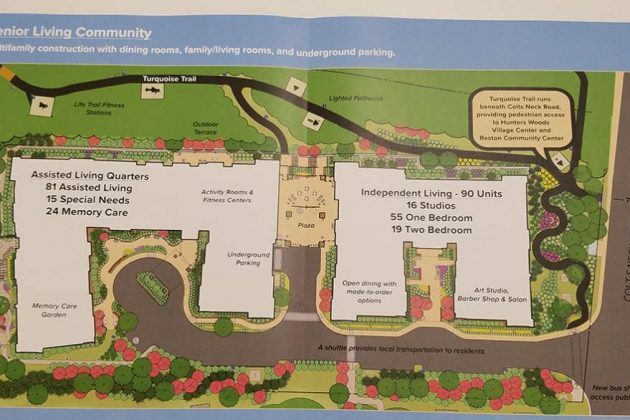 The 4.3-acre site was first approved by the Fairfax County Board of Supervisors for 210 independent-living units in 2007, but the plan was later amended to the current design. The new plan was approved by the Fairfax County Board of Supervisors in May 2016. Pennsylvania-based IntegraCare has several other communities in the Mid-Atlantic region, but this will be its first in Virginia. 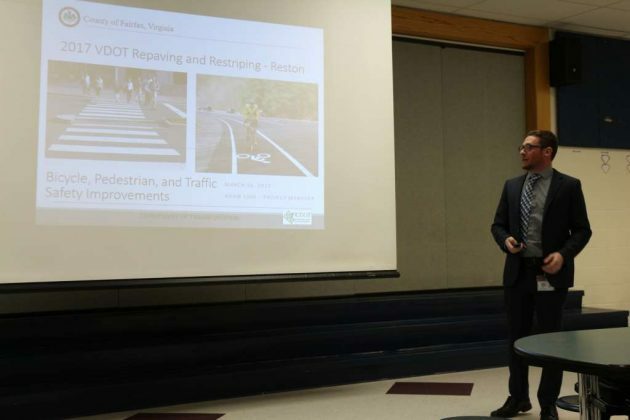 Adam Lind, county Bicycle Program manager, speaks with Reston residents Thursday. 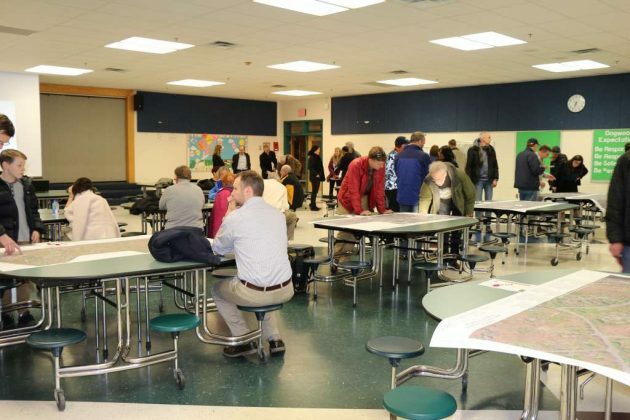 Residents look over maps of proposed street design changes. Supervisor Cathy Hudgins welcomes the crowd. Dozens of residents gathered to discuss the proposals. Adam Lind, project manager, delivers his presenation. 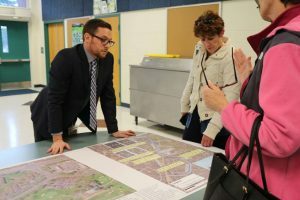 Several dozen community members filled the cafeteria at Dogwood Elementary School on Thursday to learn more — and express their opinions — about proposed changes to street designs in Reston. 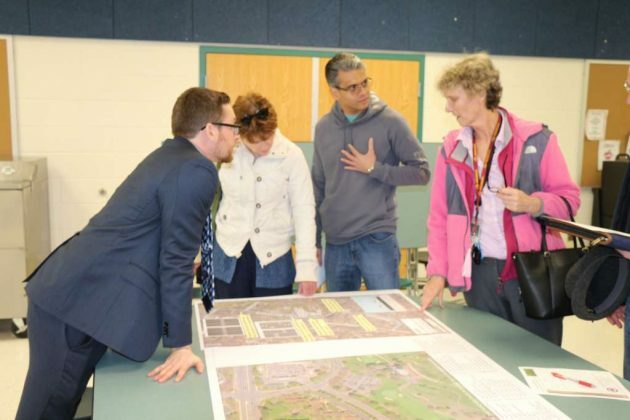 The proposal from the Fairfax County Department of Transportation to alter lanes on Colts Neck Road, North Shore Drive and Twin Branches Road drew a large amount of reaction, positive and negative, from community members who would be affected. FCDOT officials say the changes would increase safety for all users of the roads — drivers, bicyclists and pedestrians — by allowing for the addition of crosswalks, creating bike lanes and limiting speeding. The meeting was a followup from a November meeting at which community feedback on priorities for the three roads was gathered. 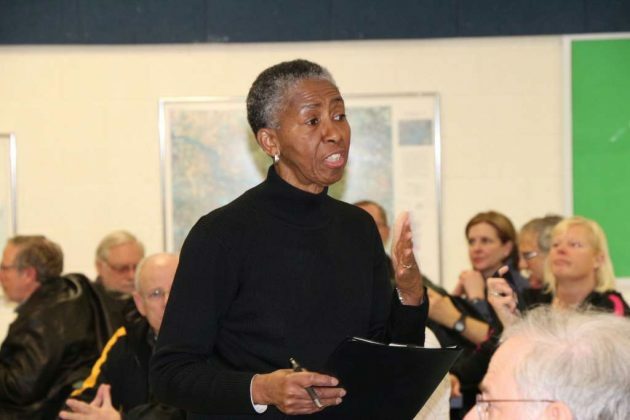 Residents raised concerns at Thursday’s meeting about the potential loss of parking in certain areas, including near Hunters Woods and Lake Anne elementary schools and the Lake Audubon Pool. In addition, worries were brought up by residents including increased congestion on Colts Neck Road and the potential danger of having one center turn lane in areas with left-hand turns on both sides. Bruce Wright, of Reston, is a Fairfax Alliance for Better Bicycling board member. He said making Reston a more bike-friendly community is important. In addition, he said, pedestrian safety on Colts Neck Road is a particular concern. 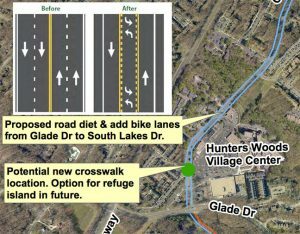 Among the proposals for Colts Neck Road is the call for the creation of at least one crosswalk at Hunters Woods Village Center and a possible pedestrian “refuge island” between lanes. Lind said to create crosswalks, a four-lane road must be altered to become a two-lane road with a center turn lane. Dave Crocker, vice president of the nearby Hunters Square Cluster, said residents of his community have been wanting crosswalks for years. Bicyclists and non-bicyclists clashed during the meeting, however, about proposals to remove parking and traffic lanes in some areas to make room for bike lanes. One resident said it is “fundamentally undemocratic” to take lanes away from drivers to provide a seemingly disproportionate amount of space for the relatively small percentage of the community that travels by bicycle. Bicyclists in attendance said providing dedicated space for riders is a major advantage for everyone involved, as they now must travel in traffic lanes in places without bike lanes. 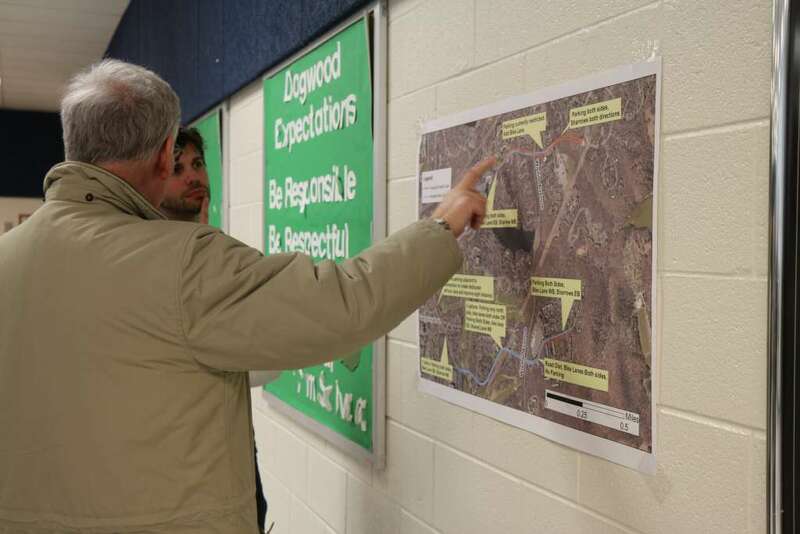 Suggestions and comments made by attendees of Thursday’s meeting were collected and will be analyzed by FCDOT, Lind said, and the plan may undergo further alterations before it is executed. FCDOT will continue to collect comments until at least March 31. Residents may submit comments by email to [email protected]. Lind said the repaving and re-striping work is expected to take place sometime between May and November.